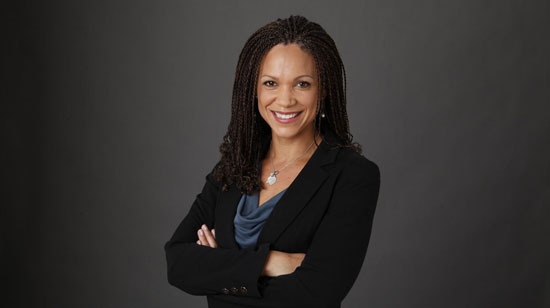 Melissa Harris-Perry, noted scholar and host of her own MSNBC current affairs program, will deliver the University of Rochester’s 2013 Martin Luther King Jr. Commemorative Address on Thursday, Jan. 17. The free talk begins at 6 p.m. in Strong Auditorium on the River Campus. As a political analyst and professor of political science at Tulane University, Harris-Perry’s address will focus on racial issues, religious questions, and gender concerns related to American politics. In addition to her show, which airs from 10 a.m. to noon on Saturdays and Sundays on MSNBC, Harris-Perry writes the monthly column, Sister Citizen, for The Nation and provides commentary on Politics Nation with Reverend Al Sharpton, The Rachel Maddow Show, and The Last Word with Lawrence O’Donnell. She is a regular contributor on Keeping it Real Radio with Sharpton, and other print and radio venues in the U.S. and abroad. At Tulane, Harris-Perry is the founding director of the Anna Julia Cooper Project on Gender, Race, and Politics in the South. The project investigates how gender and race intersect to shape women’s influence on government in the South, and includes student research opportunities, a postdoctoral program, seminars for faculty and students, and the annual Anna Julia Cooper Lecture. She also teaches the course, Black Women’s Political Activism, which uses the history of African American women’s political activism to illuminate questions of participation in American politics. In her new book, Sister Citizen: Shame, Stereotypes, and Black Women in America(Yale 2011), Harris-Perry argues that persistent harmful stereotypes can limit black women’s ability to participate in the political process. Her first book, Barbershops, Bibles, and BET: Everyday Talk and Black Political Thought, won the 2005 W. E. B. Du Bois Book Award from the National Conference of Black Political Scientists and 2005 Best Book Award from the Race and Ethnic Politics Section of the American Political Science Association. In 2009, Harris-Perry became the youngest scholar to deliver the W.E.B. Du Bois Lectures at Harvard University, and in the same year, became the youngest women to deliver the prestigious Ware Lecture. Harris-Perry received a bachelor’s degree in English from Wake Forest University, a doctoral degree in political science from Duke University, and studied theology at Union Theological Seminary in New York. She also received an honorary doctorate from Meadville Lombard Theological School. She has served on the faculties of the University of Chicago and Princeton University. The annual address, which kicks-off the University’s Black History Month celebration by recognizing the legacy and influence of King’s Life, is co-sponsored by the College Diversity Roundtable and the Office of the President. Note to Editors: Press availability with Harris-Perry will be scheduled from 3 to 3:30 p.m. on Thursday, Jan. 17, in the Frederick Douglass Leadership House, located on Wilson Boulevard on the Fraternity Quadrangle. Advanced interviews also can be scheduled by e-mailing Melissa Greco Lopes at mgrecolo@ur.rochester.edu or calling 585.276.3693.